Passing through new construction, you may have noticed an odd greenish-grey-coloured coating, alongside the road. What is that weird-looking stuff? And why is it there? The answer is – hydroseeding – a mix of grass seed, mulch, fertilizer, water and a few ingredients to make all that stick together. (The mulch is coloured with a natural and biodegradable green dye to help see where the product has been applied.) This concoction is sprayed on newly excavated or filled slopes to give them a head start to re-vegetation. Hydroseeding helps stop sediment from running into waterways. The special slurry forms a blanket on bare soil, protecting the soil from erosion and runoff, and holding the seed in place until it gets growing. The seed is a specially designed mix that is unappetizing to wildlife (animals grazing roadside can mean danger for both them and vehicles), grows quickly and forms a healthy root mass. Hydroseeding is a preferable to other erosion control techniques like traditional broadcasting or sowing of dry seed, because the mulch and tackifier (binding ingredient) hold the soil together while the seed is growing. It’s important to keep sediment and debris from running into streams, creeks, lakes and the ocean. 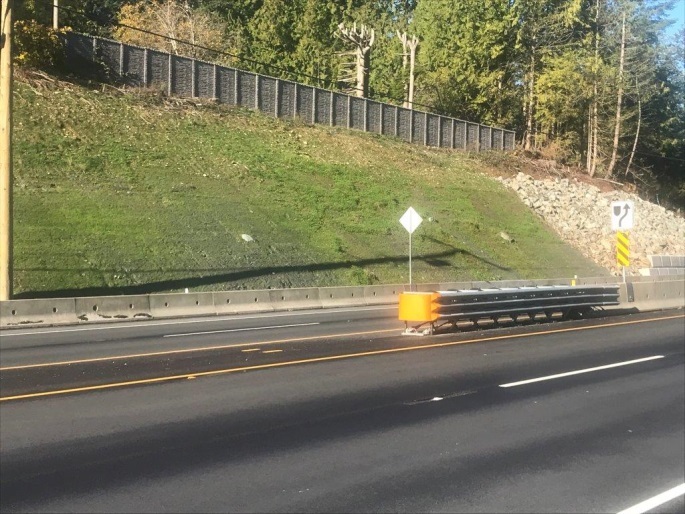 Vegetation beside highways is also critical to absorb some of the moisture from rain, snow and ice, which could undermine and damage the road base. Another method we use to prevent erosion and revegetate bare earth are erosion control blankets. Seed is first distributed on the soil, and then the long fibre mats are manually rolled out on top, and staked to the ground. This method is used in areas prone to slope erosion, or when there are environmental concerns that heavy rains could transport sediment into sensitive areas. Erosion control blankets were used here, due the slope’s steepness. Each year, we cover more than a thousand hectares with hydroseeding, as part of our construction and maintenance projects. 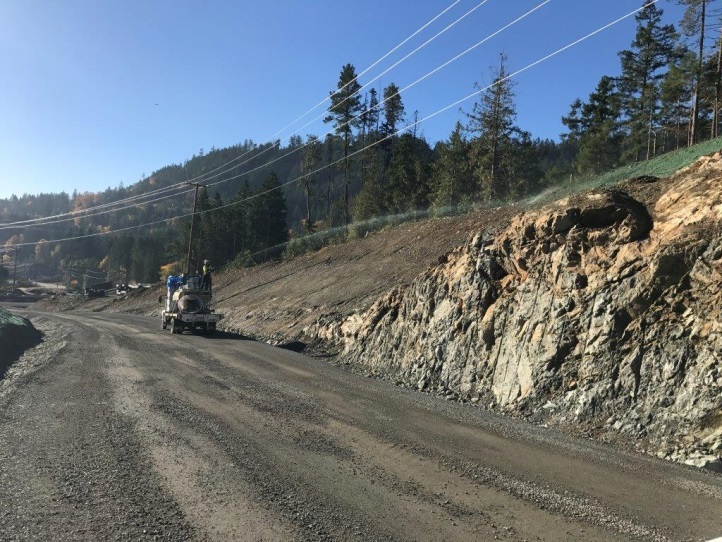 For example, hydroseeding was sprayed on about 20 hectares alongside the Malahat Highway, on southern Vancouver Island, in spring and fall 2017, and fall 2018. 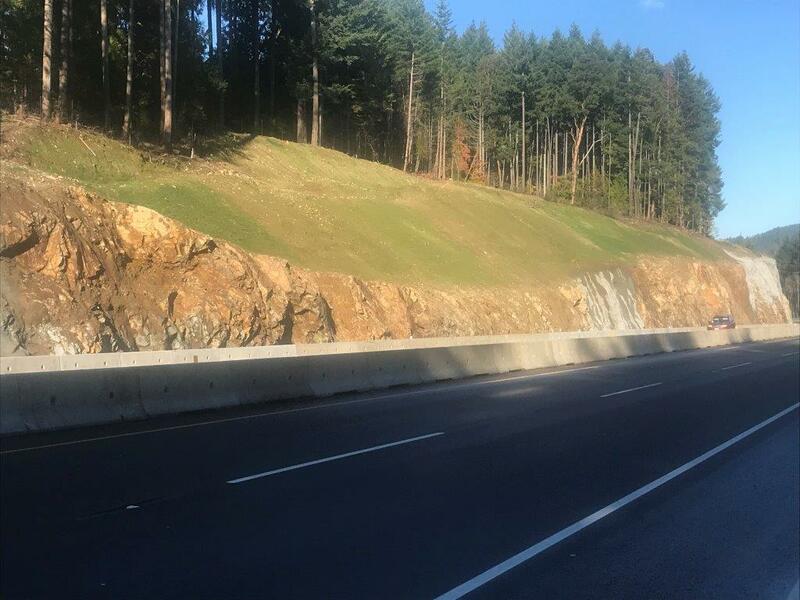 In 2018, we also invested in hydroseeding on roadsides in the Southern Interior that were impacted by wildfires, to help prevent erosion and stop invasive plants from taking root. 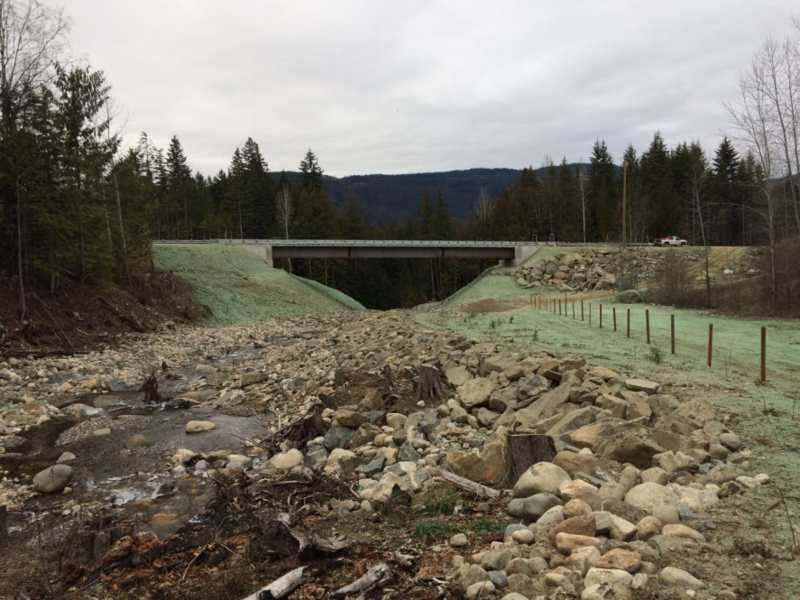 Across BC, hydroseeding is part of protecting water quality and sensitive ecosystems next to our highways, as well as halting the spread of invasive plants. Hydroseeded area greening up nicely, along the Malahat Highway. So, the next time that you see slopes looking like they’ve been slathered with off-putting hospital-green colour paint, know that the area will soon transform to good-looking ground cover. As the grass grows, weird green will give way to verdant natural beauty that protects ecosystems and highways. Do you have a question about the work we do? Ask us on Tell TranBC. 4 Responses to Hydroseeding – What’s up with the Weird Green Stuff? The green color is strictly for application purposes and usually the color fades away quickly when exposed to the sun. Though I do agree it could be a bit closer to the real thing. Both Emil Anderson Construction and the Ministry were fantastic to work with. The 2017-18 Malahat Upgrade was a great start for our new much larger capacity Hydroseed unit. How do we get on your contractors list. Thanks. Thanks for asking about contract work with us. I recommend that you monitor BC Bid. Also a lot of hydroseeding work is done through subcontracts with the larger construction companies, so you may want to reach out to them, as well. I just wish a less obviously artificial and sickly shade of dye was used!